Are you an early stage start-up based in the Somali region? Are you working at the cutting edge of innovation, or developing a tech-enabled product or service addressing a big local need? Are you passionate about your business idea? Apply for Innovate Accelerator today! Innovate Ventures is the leading Somali start-up accelerator and technology fund. The program partners with VC4A, Telesom and Oxfam as part of Work in Progress! project. To date, the programme has graduated 25 start-ups and has invested almost $30,000 in its graduates. As part of the acceleration package, you will receive training, mentorship by domain experts, access to an extensive business network, visibility and a chance to get investment. Equity funding for at least 3 startups of up to $30,000. Complete the application form before June 15th to qualify for the accelerator program. You will hear back from the Innovate Ventures team within four weeks whether your start-up has been selected. If selected, you will be asked to participate in our 1-week pre-acceleratorbootcamp. After the bootcamp, 12 start-ups will advance to the main program. The program will take place in Hargeisa. The program will conclude in a Demo Day, where start-ups will pitch to a room full of local and international investors and media. The top 3 start-ups will receive up to $30,000 in equity investment from the Innovate Ventures Fund. Submit your application today! Applications close 15 June, 2018. 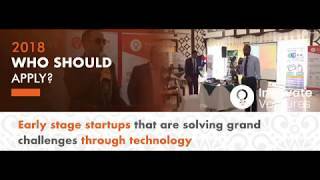 About Innovate Ventures:Innovate Ventures is the leading start-up accelerator and technology fund in Somaliland and Somalia. Innovate Ventures was created to propel and accelerate technology start-ups in Somalia and Somaliland, support the next wave of Somali entrepreneurs, and grow the nascent start-up ecosystem in the country. Innovate Ventures have run coding camps, incubators and accelerators in the Somali region since 2012. About Work In Progress! Alliance: The Work in Progress! Alliance is focused on unlocking the economic potential of young women and men in Egypt, Nigeria and Somalia. The project aims to enable them to generate sustainable and living incomes – by finding regular employment or starting enterprises. Alliance partners include Oxfam, VC4A and Butterfly Works. About VC4A: VC4A is a platform for startup funding and dedicated to building game changing companies on the African continent and supporting the growth of Africa’s startup ecosystem. About Telesom :Telesom is the largest telecommunications company headquartered in Hargeisa, Somaliland. Telesom provides a variety of mobile communication products and services. It offers prepaid call plans, monthly subscription plans, International Roaming, MMS, WAP (over both GSM and GPRS), residential fixed line services, and broadband internet plans.